Twenty-eleven will be the "year of launchers", says European Space Agency director-general Jean-Jacques Dordain. Europe expects to have three different rockets operating from its French Guiana spaceport in the coming months. The workhorse Ariane 5 will be joined by the Russian Soyuz vehicle and a new small launcher called Vega. At his annual Paris press conference to preview the year ahead, Mr Dordain said this represented a major change in the way Esa conducted its space activities. And he told the BBC everyone might be surprised at how complex an undertaking this would be. "For 30 years we have exploited one launcher, the best launcher in the world, Ariane - but it was one launcher," he explained. "From this year, we will exploit three launchers in parallel - Ariane, Soyuz and Vega. It will introduce some constraints because the traffic will be much heavier from [the spaceport], and I'm not so sure we've yet totally understood the constraints which are linked to the exploitation of three launchers instead of one." A completely new launch facility has been constructed for Soyuz in French Guiana, allowing the Russian-built vehicle to shift some of its operations to the European spaceport from its traditional home of the Baikonur Cosmodrome in Kazakhstan. The launch complex will have its qualification review in April with the expectation that the first Soyuz lift-off occur sometime between 15 August and 15 September. The rocket will carry into orbit two spacecraft for Europe's Galileo satellite-navigation system. Vega will use the old Ariane 1, 2 and 3 pad, which has been renovated for the purpose. Both the pad and the rocket system itself will have to get through a review process before being cleared to launch. Only when that process is complete will a maiden flight date be set, but it should be in the second half of the year. Because Vega is a brand new design, the payload opportunity has been given to some small, inexpensive scientific spacecraft rather than to high-value institutional or commercial ventures. With three different rockets in its stable, the South American spaceport is going to be extremely busy. Launches could be occurring at the rate of about one a month in future. The performance of the company operating these systems is a matter to be addressed by Esa member-states in the coming weeks. 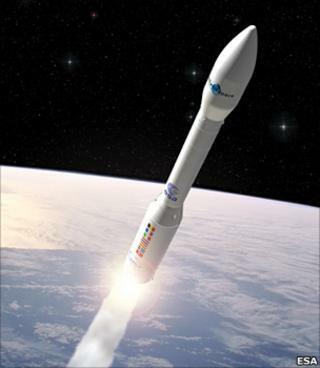 Arianespace, based at Evry near Paris, sells Europe's rocket services. It is currently losing money and is looking for a cash injection from European governments. Mr Dordain said Esa member-states wanted more information first on the financial status of the company and a clearer understanding of the costs of building the Ariane 5 before committing to an aid package. "If needed, if needed," the director-general stressed. "The member-states are ready to make the exploitation sustainable, not because this is a commercial market. This is not the objective. "The objective is to make sure the Ariane 5 is there for their own government needs. That should not be misunderstood. This is not a contribution of the member-states to a commercial business; this is a contribution of the member-states to the guarantee of access to space," he told BBC News. The matter will come up at the March Council Meeting of Esa. This same meeting will also have to resolve European funding for the International Space Station (ISS). Although philosophically committed to the extension of ISS operations from 2015 to 2020, Esa member-states have yet to put a financial framework in place to make it happen.